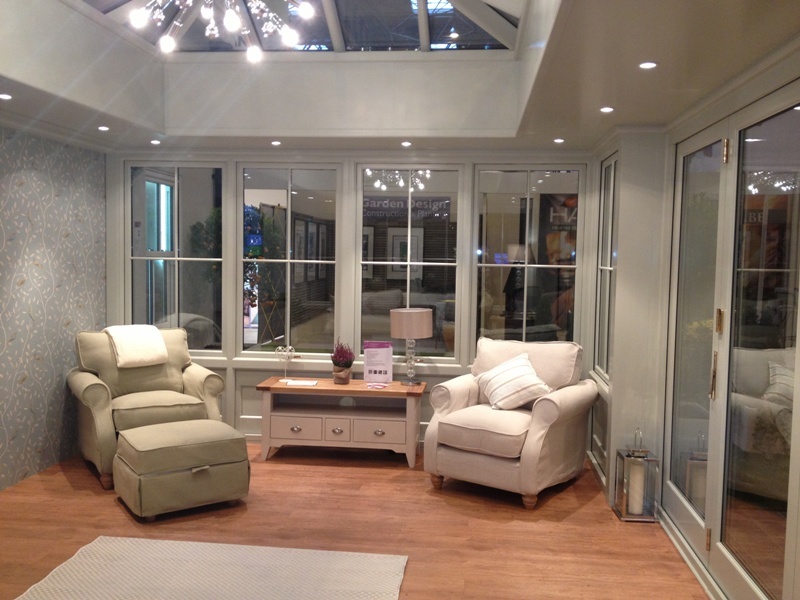 We love a good exhibition and after Grand Designs Live at the weekend, I have spoken to our head of exhibitions, Caroline, to discuss how she decides upon the style and décor of our stands, in particular the Anglian orangery that was on display. How long does it take to arrange, design and build these stands? It takes months of preparation to arrange these shows and design the stands, as we iron out the finer details and optimise the stand with our best product to make it a logical, enjoyable journey on our stand. It has to be eye catching, inspirational and something you can replicate in your own home. Nobody wants to come to a stand that is boring! The build is normally a 2-3 day process, as we build the stand from scratch, custom built to house our products. The Orangery stand at Grand Designs Live was actually used at Hampton Court Palace Flower Show and looks fantastic on site. 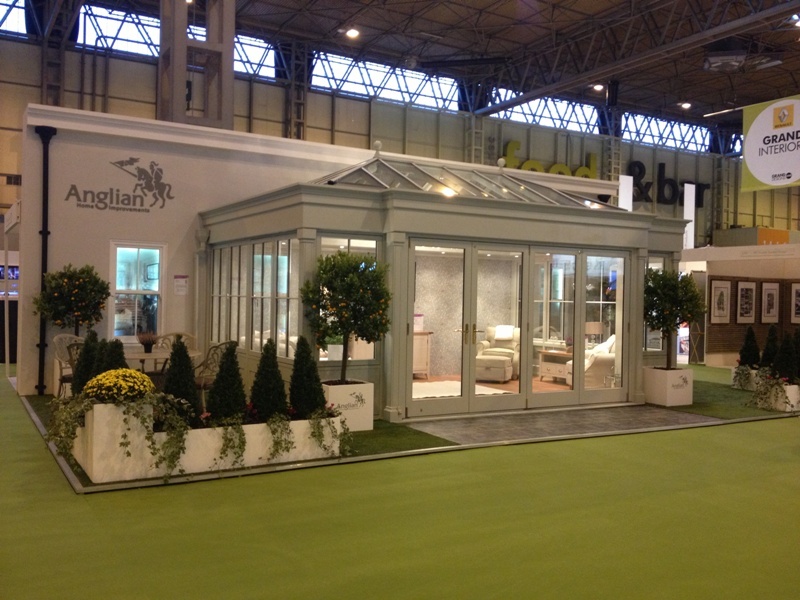 How did you decide on the style, finish and design of the orangery that’s on display? 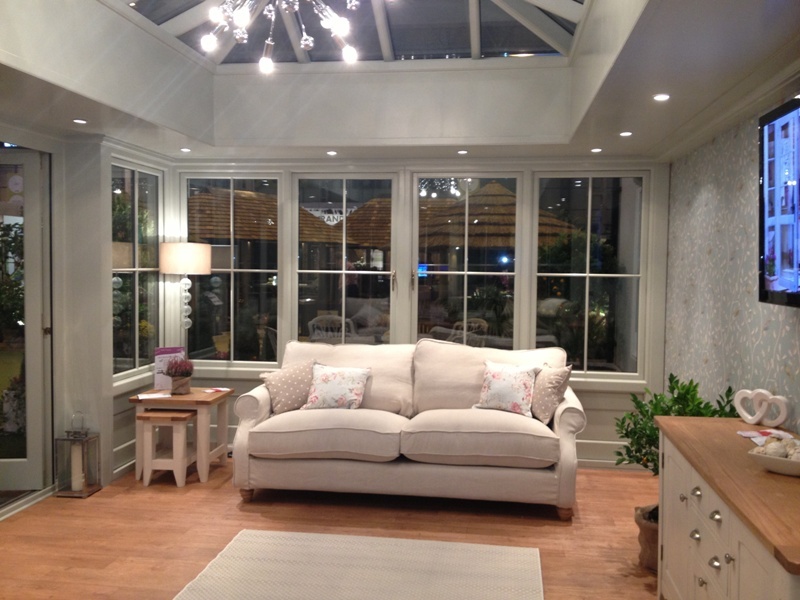 The Edwardian style of conservatory and orangery is very popular with our customers, so it was an obvious choice for us. To have it built with timber, a lantern style roof, finished in a subtle sage green adds class and luxury to it. It is also built to show off our new bi-fold doors, the Solaroof technology (which was a blessing at Hampton Court as it was so hot!) and different window styles including top and side hung casements.We also demonstrated our new range of guttering and roof trim to help give visitors an idea of how the end product would look on their homes. How did you decide the decorations and furniture? We wanted to find decorations and furniture that would compliment the sage green, and add life and character to the orangery. We have a few good contacts in the world of interior design who we take inspiration from, which always helps. 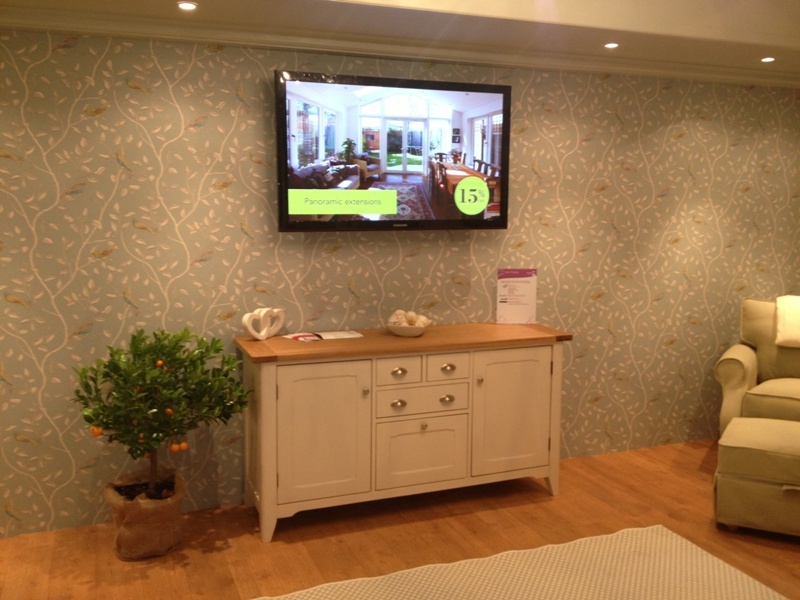 We decided on a pale duck egg blue/green wallpaper from Wallpaper Direct with leaves and birds pattern to create a feature wall onto the adjoining stand. Using a large chandelier and lamps from B&Q in addition to spot lights hidden within the pelmet of the Orangery, we were able to prove some ambient lighting. The fabric furnishings were from DFS and we have quite a selection here. The Country Living Range is fabulous and gave us the classic shabby chic look and feel. The Natural coloured sofa is beautifully contrasted against the natural sage arm chairs and sage footstool. Comfy and easy on the eye. The DFS Shore range, which is being used in our orangery includes a sideboard, a nest of tables, a coffee table and TV unit. The natural colour and solid wood top only enhances the look we are going for and fills the room with a homely ambience. Which is your favourite item of furniture? My favourite is the natural plain sofa…it is incredibly comfortable and the quality is second to none – DFS are a UK manufacturer and the care and attention to details that goes into their furniture really shows in the final product. What is your favourite part of the orangery? I love the lantern roof! It lets in so much light and even in the heat of summer it is never unbearably hot. The Solaroof technology definitely helps this room stay cool. It also keeps the heat in during winter…that’s how clever this technology is! What is the best thing about managing the exhibitions? The travelling around the country, meeting new people and getting to redecorate every year.